FERDINAND MAGELLAN, one of the most distinguished explorers in world history, was born in to a middle-class Portuguese family. In his youth, Magellan was awed by Christopher Columbus’s seafaring adventures, and he developed a strong interest in the sea and enlisted in the navy in 1505. While serving as a naval officer, Magellan participated in various victorious battles that gave PORTUGAL immense power in the INDIAN OCEAN. One such victory resulted in the conquering of Malacca, which gave Portugal control of vital trade routes in the region. 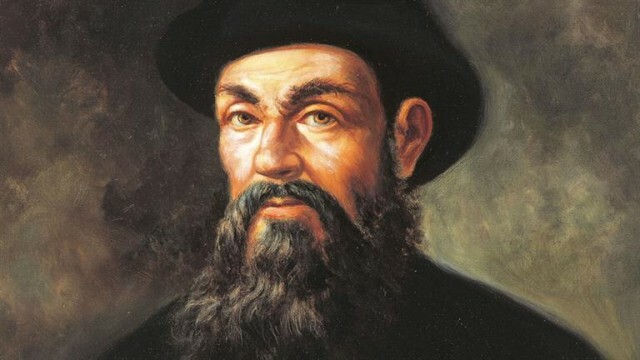 Magellan traveled on ships that traded throughout the world, studied charts, and listened to tales of great adventures. Magellan was convinced that a water route existed somewhere between the enormous landmass from the North Pole down to South America. He dreamed of one day finding this route and sailing around the world. In 1494, Pope Alexander VI orchestrated the Treaty of Tordesillas, which divided the unknown world. The eastern part of the world was given to Portugal and the western part to SPAIN. However, the treaty’s boundaries in the east were virtually unknown, for no one had actually sailed around the world. Throughout Magellan’s naval years, he and the Portuguese king, Dom Manuel developed a particularly strained relationship. He once asked the king for a rise in rank and pay and the king refused. The king also refused to allow Magellan to command a royal ship sailing to the Spice Islands. Thus, Magellan turned for sponsorship for an epic voyage to the Spanish monarch, King Charles I. He asked for approval from the Spanish king to conduct a voyage, which would possibly create permanent boundaries between Spain and Portugal in the PACIFIC OCEAN. He also wanted to determine whether the Spice Islands were actually within Spain’s boundaries. King Charles approved of the plans, and on September 20, 1519, five ships, the Trinidad, San Antonio, Concepcion, Victoria, and the Santiago, along with a crew of 270 men, set sail on a journey full of mutiny, discovery, and death. The voyage began with numerous problems. Before departure, the king of Portugal hired secret agents who loaded empty water barrels onto the ship, and changed the ships’ cargo records. When Magellan left Spain, he had mistakenly believed that his ships were fully equipped for the sailing. The five ships were also not of the best quality, and the Spanish crew made plans to lead a mutiny and kill Magellan at sea. While stopping at the CANARY ISLANDS to resupply, Magellan heard of the plans, and subsequently put the conspirators in chains. the Guarini natives, who believed the men were gods. After a few weeks in virtual paradise, the sailors stocked up on food and water and sailed further south along the east coast of South America, hoping to discover a route to the Pacific Ocean. However, with winter approaching in the Southern Hemisphere, the seas became increasingly treacherous and the weather turned cold and stormy. Many crew members were calling on Magellan to turn back to Rio de Janeiro, but the leader persisted in his quest. After hugging the South American coast for 60 days, through storms and high seas, Magellan instructed the ships to pull into the present-day bay of Port St. Julian. From Palm Sunday to late August, Magellan and his crew were anchored in the bay. Throughout this period, mutiny was discussed by crew members. A rebellion took control of three of the ships, and 170 out of the 265 men were involved. Magellan ordered numerous executions and marooned mutineers. With these actions, he regained the control and respect of the sailors, however, he lost the Santiago in May, after it was wrecked in rough seas while on a reconnaissance mission. Although the ship was destroyed, the 37 crew members were saved. By October, 13 months after first setting sail, Magellan and his crew once again traveled south along the South American coast. On October 20, they found a beautiful bay that led into a strait. For weeks, the ships navigated their way through the treacherous strait with strong currents, gusty winds, and steep cliffs. The crew on the ship San Antonio, however, decided that the risks were too high and actually turned around and headed back to Spain. Unfortunately, this ship carried much of the food and supplies. On November 28, 1520, the Trinidad, Concepcion, and Victoria entered a vast tranquil sea, which was named the Pacific Ocean. The crew was overjoyed to escape the straits but the excitement was short-lived. Facing nothing but water in front of them and horrid conditions aboard the ship, many of the starving crew wanted to turn back for Spain. However, Magellan would not turn around and believed the Spice Islands were only a few days away. With the absence of any charts, Magellan’s estimates of the proximity of the Spice Islands were not even close, and the three ships continued northward across the endless ocean. For 96 days, the three ships did not see land as they crossed the Pacific Ocean. They sailed along the peaceful ocean with the aid of trade winds and, unbelievably, missed every single Pacific island. The food supplies and water were dwindling, and the crew was inflicted with scurvy. Many of the crew members were dying, and toward the end of the journey, the men began to eat ox hides and sawdust. Finally, on March 6, 1521, Magellan and his crew landed on present-day GUAM. For three days, the crew made minor repairs and tried to renourish themselves. They set sail again, and on March 16 the crew arrived in the PHILIPPINES. They became the first Europeans to set foot on the islands. For six weeks, the men explored the islands and began to try to convert the islanders to Christianity. Some of the indigenous people were hostile toward the spread of Christianity and waged a battle against Magellan and 48 of his men on Mactan Island. While dressed in full battle armor, Magellan was struck and killed by an islander. With their leader now dead, the remaining crew of 115 had to somehow return to Spain. The Concepcion was burned, and the Trinidad, after being blown off course, was captured by a Portuguese battle group off the coast of JAPAN. The Victoria was now the only remaining ship from the expedition. Sebastián del Cano became the leader, and he and a crew of 47 battled through months of monsoons, heat, and frigid cold. On September 6, 1523, the battered Victoria returned to Spain. The remaining crew had dwindled to only 18 Europeans. Although Magellan did not survive the expedition, his glory in Portugal has survived through centuries. The leader of the first expedition to circumnavigate the globe traveled to where no European had been before and set a precedent of success for future European explorers.